Add clusters of unexpected panache to your decor with this multicolor micro-bulb grapevine light set. This string of grapevine clusters is a fun and colorful accent to hang just about anywhere. Just watch your party area get transformed into a fun and whimsical place. 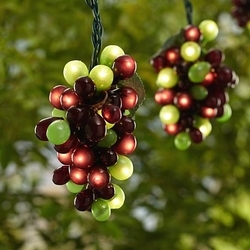 Ten bright multicolor grape clusters glow on an 48 ft. strand, for use indoors or outside. Watch the magical transformation this set brings to your patio or awning . . . Colorful grapevine string light set. • 100 micro-bulb grape lights. • Multicolor finish grapes and grape-lights, with frosted leaves. • 5 clusters of 20 micro-grape lights plus 10 grapes in each. • Each cluster measures 10" by 2 1/2".